Hollywood has been infatuated with remakes in recent years. "The Lone Ranger" is the perfect vehicle: it has a stunning setting (the Wild West), there are familiar but not overly used characters (ahem, Spider-Man), and the TV series is old enough to be nostalgic but still fresh to younger viewers. And while there are many things to like about Gore Verbinksi's big-screen adaptation, notably Johnny Depp as Tonto, the film feels bloated and excessive. Verbinski directed Depp in three previous "Pirates of the Caribbean" films, and their collaboration is the most effective thing about the film. Verbinksi expertly captures Depp's dry humor -- Tonto's stone-faced one-liners generate plenty of laughs. 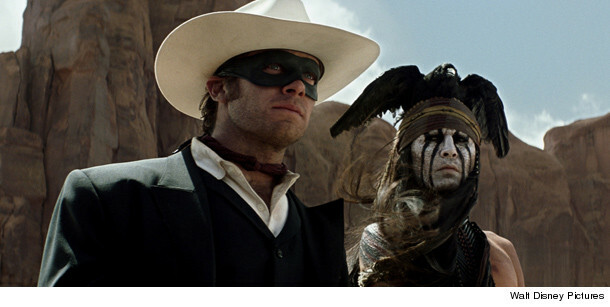 Tonto (and his dead crow headpiece) steals the scenes from the film's titular character, played by Armie Hammer. Armie certainly has the looks and stature of a leading man, but ends up more the sidekick in many scenes. Together, Tonto and The Lone Ranger find themselves in plenty of funny and/or precarious situations. Too many, unfortunately. At 2.5 hours, "The Longer Ranger" is a wild but way too long ride. Granted, both main characters' origin stories take time to be established, but there's an unnecessary flashforward plot device that adds screentime and little else. There's a potential romance that is hinted at but not explored. And the final, cacophonous ending action sequence rivals "Man of Steel's" in bloat. Despite the excess, Verbinksi skirts the film's more serious issues of the genocide of Native Americans and subjugation of Chinese laborers. However, despite concerns by some tribal groups, Depp seems to treat his role with deference. William Fictner and Helena Bonham Carter are underutilized as the villainous Butch Cavendish and plucky Red Harrington, respectively. And I'd be remiss in not mentioning the great Tom Wilkinson as railroad tycoon Latham Cole. If you like "Pirates," you'll like "The Lone Ranger." But like transcontinental railroad that at the core of the film's plot, it gets longer and longer and you can't wait for it to finish. EXCLUSIVE: "Lone Ranger" Stars' Freedom Fighter Roots! Video: Johnny Depp Trampled By Horse on "The Lone Ranger" Set!